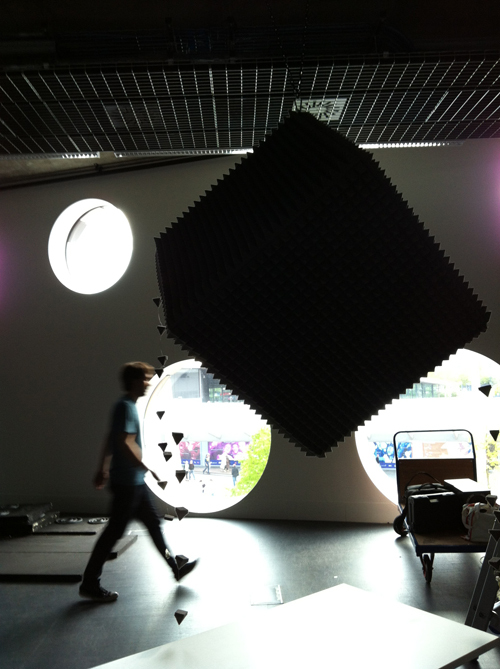 Stylus is a site-specific artwork created for the Music Tech Festival at Ravensbourne 17th-19th May 2013’. We exhibited a second time in July 2013’ at Goldsmiths‚ this time in collaboration with Martyn Ware (Illustrious) who enhanced the piece with his 3D sound system. Stylus is an attempt to combine sound and vision in perfect synthesis. Simple looped patterns of visual music building to a complex and melodic kinetic sculpture where the conceptual resonance and counterpoint between image and sound are bonded in a way that the audio visual contract feels inevitable. As with other diasynchronic artworks‚ Stylus takes place in an immersive environment‚ but participants can walk all around the sculpture‚ taking an embodied journey of meditation as their senses become accustomed to the space. Creating an embodied experience has always been a fundamental of the diasynchronic technique and to achieve a work that can be appreciated in the round is a real milestone in our development. As such we feel it warrants a greater artistic meditation on the artwork. Why is walking around the artwork a milestone in the technique? Above all else‚ the Diasynchronoscope is an embodied experience. It is about being there. There is no substitute for this‚ artworks are conceived to be experienced in a shared space and the experience is a somatic one. This is the first time that the embodied and screenless nature of the Diasynchronoscope experience can be explored in the round‚ making it something of a technological breakthrough for the artists as it requires multiple projectors and careful conceptualization (there is nowhere to hide). What do you mean by Audio Visual contract? Stylus is about sound and image and perception. 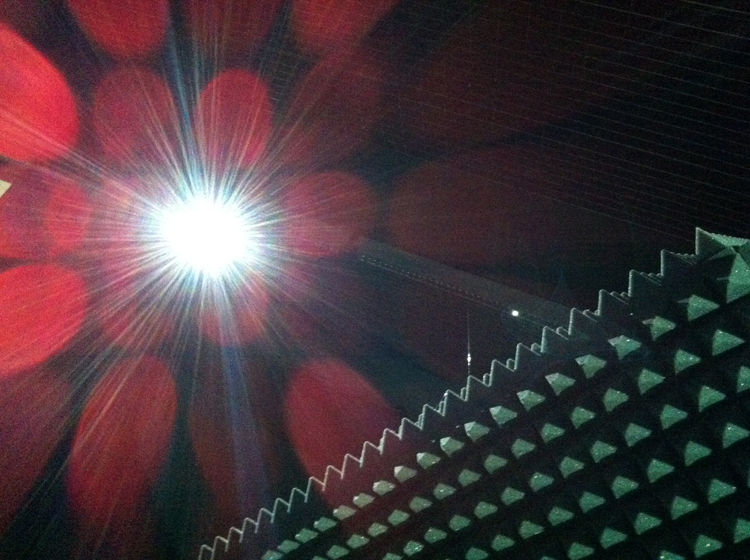 The main‚ permanently lit part of the sculpture is a hanging cube‚ created (ironically) from acoustic foam. Vinyl records were played using a diamond stylus that ran through grooves‚ picking up the tiny ridges and indentations to reproduce sound. 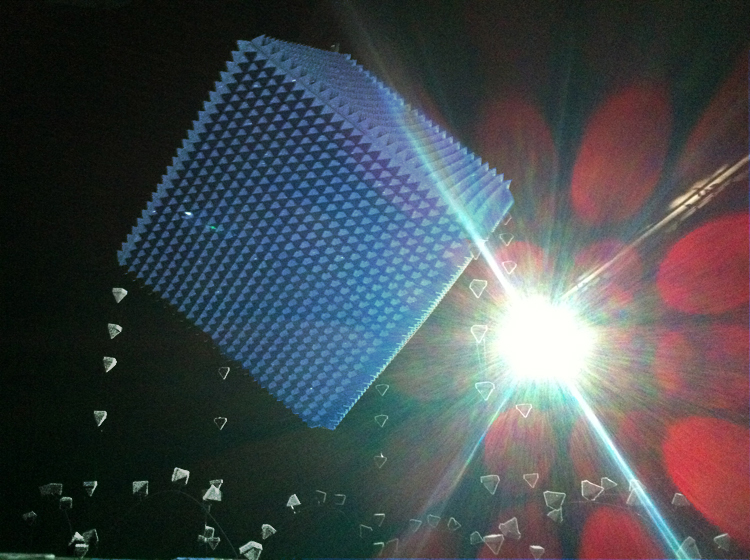 The hanging cube resembles a large diamond‚ and with the ridged profiles also looks like a diamond at huge magnification. Dripping sounds and coloured ripples provide audiovisual counterpoints to the hard ‘diamond’ looped digital sounds that build to create melody in the artwork. The elemental nature of a diamond being made from carbon‚ and water (made of hydrogen and oxygen) appeals to us at a primordial level. They are the fundamental elements that gave birth to life on our planet‚ and we are composed mostly of these elements. A major visual inspiration for the artwork was observing a dripping tap in the morning sunlight. As the drip formed‚ it sparkled brighter than any diamond and then fell. What if the sound it made when it dropped was the sound the visual suggested? That of a hard diamond? Stylus from Diasynchronoscope on Vimeo. What ‘message’ should I take from the artwork? There are several layers to experiencing Stylus and as each percipient is different‚ as many different messages. As artists‚ a main part of what we were trying to explore in the artwork is that of decoding and discovering what is already there‚ but invisible. In this sense‚ Stylus is intended to celebrate the miraculous way that a diamond stylus materialises sound from a disc. It is impossible for a person coming new to these objects to backwards engineer sound from each component part‚ and yet they both exist and were created for that purpose: The stylus and the disc form an inevitable marriage that is required to decode and uncover something ethereal that is at once there‚ but not there. This extraction of something from nothing through perceptual revelation echoes how we feel about the diasynchronic medium as an artform. Why did you create a hanging cube rather than a diamond? Thus on an embodied perceptual level‚ Stylus represents Merleau Ponty’s ‘tour of inspection’ of a cube. When shown at the Music Tech festival‚ we were interested to see if people would move around the artwork or stop still to contemplate it. In fact people did both and many stayed for a long time. 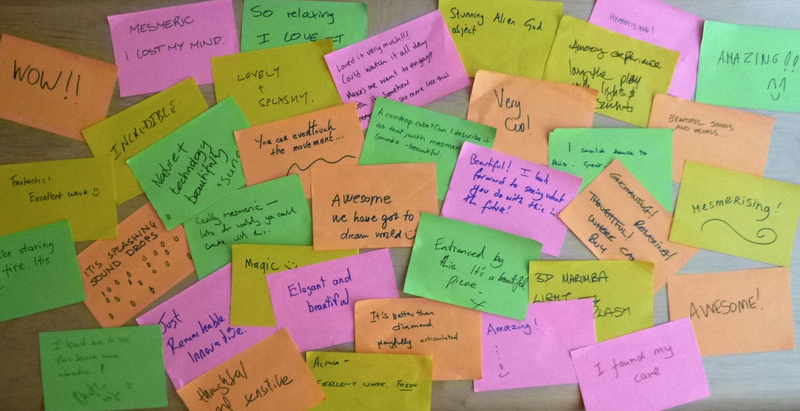 We collected feedback on post-it note and many of the notes remarked on the hypnotic and mesmeric nature of the artwork. The artwork generally produced a sense of peace and well-being. Some feedback: ‘Stunning Alien God object’‚ ‘It’s better than a diamond – playfully articulated’‚ ‘entranced by this. It’s a beautiful piece’‚ ‘A raindrop cube? Can I describe it as that‚ with mesmerizing sounds – beautiful’‚ ‘Loved it very much! Could watch it all day’‚ ‘Nature and Technology beautifully “sung”’. Yes‚ we can‚ but has it occurred to you that it is already interactive? Monks learned knowledge from books‚ walking the cloisters‚ it is well known that perambulation‚ or simple embodied action helps many people learn. When people enter the space‚ they are uncertain‚ they take small steps in the dark – first (at 3 o’clock) they see flashes of pixels‚ and hear primitive sounds of a cave‚ of drips – as they circumnavigate the space‚ (to 6 o’clock) the movement becomes apparent and the sound builds to melody. Their steps become more confident as they begin to comprehend the space. As they reach 9 o’clock the sculpture has revealed its mysteries – the underlying structures that create the sound and vision are revealed at a molecular level. People are sure of the space and move with ease‚ deciding to stay or leave. This has taken time. Most visitors spent about 5 mins in the environment. Their attention was held and their knowledge and experience developed over this time. If they wanted to take it further‚ they could contemplate the concepts behind the piece – why diamonds and water? Why stylus and discs? They could wait and observe the length of a loop and what happens if they start at a different point. But often sharing the environment is enough to make them realize that without them being in the room‚ there is no movement‚ and no sound that goes with the visuals. In a Zen sense: The tree May or May not fall in forest – it is immaterial unless it is witnessed. This leads to sense of peace and knowledge. So the work is interactive in an indirect way; not in the sense of it changing in response to the spectator‚ but in asking that the spectator change in response to the artwork‚ and by anticipating‚ rewarding and responding to these changes.